Click here for the TICKET TIERS. When will I Love Anisong tickets go on sale? Early bird tickets will go on sale on 18 May 2016 (Wednesday), 10am, until 31 May 2016 (Wednesday), 11.59pm. All remaining tickets will be available on 1 June 2016 ,10AM until it is sold out. What are the ticketing charges for the tickets? Ticketmelon has a service fee that will be displayed on our website before you confirm your purchase. Please note that Ticketmelon service fee is different from payment channel service fee. Each payment channel service fee charges may vary. How will seats be assigned for VIP Packages and tickets? VIP tickets will be assigned on a first-come-first-serve basis, meaning customers who purchase first will get the best seats! Please note that you will only know your seat number after payment has been made and confirmed. What sort of ticketing plan is being used for ||I Love Anisong|| concerts? The “I Love Anisong” concerts are based on reserved seating for VIP tier and free standing first-come-first-serve for GA tier. Please note that no refunds will be entertained under any circumstances. Once the transaction has been paid for and your e-tickets are e-mailed to you, no refunds, no cancellations or exchanges will be entertained. Please ensure that the number of tickets you wish to purchase is correct before finalizing the transaction. Tickets are not transferable and may not be resold, nor redistributed or used for any commercial or marketing event, activity, promotion or purpose, without the prior written consent of SOZO and the ticketing agent. All rights reserved to cancel any Tickets that have been transferred or resold or redistributed or otherwise used without the prior written consent of SOZO, and to deny any such Ticket Holder entry. How can I buy I Love Anisong concert tickets before the event? How can I pay for my tickets to I Love Anisong? There are 2 ways to pay for your tickets to I Love Anisong with either Credit/Debit Card or Cash! Sign in to your Ticketmelon account or register if you don’t have an account yet. Select your ticket quantity and proceed to check out. Select the credit/debit card option and enter in your card information and press “Buy Ticket”. If a thank you page shows, it means that your payment was successful! We currently accept only VISA and Mastercard. Some banks may have restrictions for online purchasing with debit cards. For Debit card users, if you are unable to make a successful purchase, please contact your bank to authorize your debit card for online transactions. Sign in to your Ticketmelon account or register for a new one. Select your ticket quantity and proceed to ‘Check Out’. Select the ATM/Counter Service/Bank Counter/Internet option and pick your channel. Then Press “Buy Ticket”. Follow the instructions in the top right corner. If your payment was successful, you will receive an email confirmation or you can check your ticket under “My Tickets”. Important! You must pay within 2 hours after checking out. 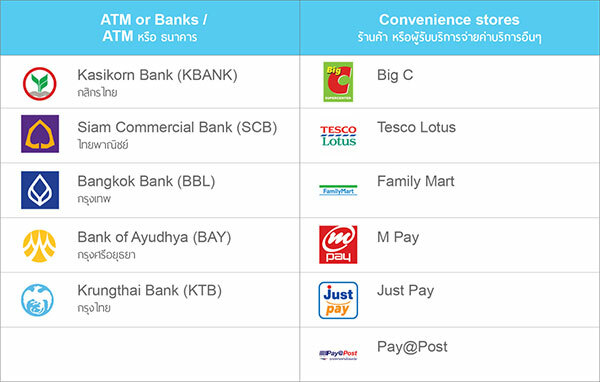 For customers using KBank or Bank of Ayudhya, please pay within 40 minutes from the time of checkout due to the bank’s processing time. Is there any other way to purchase tickets other than through the website or via other payment methods like cash? Tickets can be purchased at the venue with either cash or credit card. I'm a foreigner, how can I purchase the concert tickets? For foreign credit/debit cards, there are no additional Ticketmelon fees. Currency exchange rate is up to your card issuer. Please contact your bank directly. If you wish to purchase by Cash, we currently only accept local payment channels. How can I collect my I Love Anisong Concert ticket(s) if I purchased them online? Your ticket will be attached in the payment confirmation email. You can also find your ticket(s) is located under ‘My Tickets’ when you sign into your Ticketmelon account. What if I have lost my e-ticket(s) or suspect that my e-mail has been compromised? Immediately send an email at [email protected] for assistance. What is the period of time in which I must complete the transaction? For Credit/Debit Card users, you will receive your ticket the moment the payment has been processed (usually instantly, but may vary due to internet connection speeds). For those who pay by Cash, you must pay within 2 hours of checking out. Any payment made after the given time period will not be considered valid and you must request a refund directly from the Bank. Do I have to register an account of Ticketmelon’s site to purchase the tickets? Yes, you must be a registered Ticketmelon user to be able to purchase a ticket. You can sign up with your Facebook account or email. Is there any deadline in purchasing I Love Anisong concert ticket(s) before the event? Online ticket sales will on Aug 17 and continue onsite from Aug 18 at 3pm. I have booked I Love Anisong concert ticket(s) outside of the country; can I collect my tickets during the event day at the event venue? Your e-tticket will be attached in the payment confirmation email. You can also find your ticket(s) is located under ‘My Tickets’ when you sign into your Ticketmelon account. You will still need to redeem the wristband from the venue during the event. Where will the collection point for the concert wristband at the venue be and what are the opening hours? Your wristbands can be collected at the designated counter outside the venue. Please note that you can only collect your wristbands on the same day of the concert you bought the ticket for. You can only redeem your wristband for Aug 19 on Aug 19 and your Aug 20 wristband on Aug 20. There will be no redemption in advance. Redemption counters will open at 10am on Aug 19 and Aug 20. Do I need to show anything to redeem the concert wristband? Sign in to your Ticketmelon account on your phone, and show it to the staff at the entrance of the event. Show a screenshot of your ticket (with the QR code) and show it to the staff at the entrance of the event. Print out the ticket and show it to the staff at the entrance of the event. If you purchased multiple tickets, you can screenshot or download the ticket to send to your friends. Each QR Code will be valid for only 1 user. QR Codes that have been validated cannot be validated again. Will there be any on-site ticket sales for I Love Anisong ticket(s) on the day itself? Tickets can be purchased at the venue. What payment method can I choose for on-site ticket purchase? You can choose to pay either by cash or by credit card. How do I enter the concerts with my tickets? Your wristband that you will be redeeming at the event can be used to access the concert. It is the same wristband that is used for entry into the stage and exhibition areas. For concert VIP ticket holders, you will need to bring along your e-ticket that shows your seat number as proof of your seat for verification and if any dispute over seats arise. In which hall(s) will the concert be held? The concert will be held in Royal Paragon Hall 3, 5th floor, Siam Paragon Shopping Center. What time will the concerts start? Doors to the concert will open at 6pm and the concert will start at 7pm. Am I allowed to take pictures or record videos during the concert? All recording devices, inclusive of sound and visuals, are strictly prohibited. We reserve the right to remove those caught doing so from the hall without refund. Can I move from my seat during the concert? As a general rule, you may stand at where your seat is. However, leaving your seat to stand at another location, e.g. an empty seat, the aisle, etc, is not allowed at anytime during the concert. Persons who are found leaving their seats and standing at another location will be asked to return to their seats. Repeat offenders will be removed from the concert. Can I Love Anisong Concert tickets help me gain entry to the exhibition and/or stage? Purchasing the VIP and Standard I Love Anisong tickets entitles you to Exhibition+Stage Access ticket(s). These tickets come in the form of a wristband and are to be worn at all times. Entitlements depend on the type of ticket(s) purchased. These tickets can only be redeemed at the venue. Please note that all wristbands are to worn before entry into the exhibition area, stage area or concert area. Entry will be refused if wristbands are not worn before entry. Entry will also be refused if wristbands are worn loosely and can be slipped off easily. Note that all prices mentioned in the FAQ and the AFATH website are in Thai Baht.